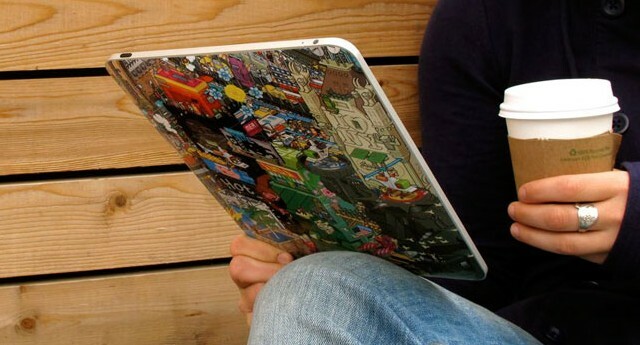 For some time, I thought Apple’s Smart Cover was one of the coolest features of the iPad. But then I saw it in action and changed my mind. In fact, the Smart Cover is a stupid idea, because it is a disappointing compromise between screen protection, a stand, and the desire to show off the iPad’s slim design. For this reason, the Smart Cover lands on my list of “must-have” iPad accessories you should not buy. Read on for more details on what is wrong with the Smart Cover and what might be better alternatives. UPDATE: Someone at Apple must read my blog, because they introduced the Smart Case ($49). While the Smart Case addresses the first point of my Smart Cover critique below, the other points still seem to be relevant, and I still think that there are better alternatives for a case out there. A few are listed in this post, and I have written an update on stylish iPad cases here. If you are more about function than form: I have also written a post about keyboard covers that not only protect your iPad but also turn it into the ultimate writing machine. Apple excels in a couple of things. One of these is that they design stylish, powerful and pricy hardware, and another one is that they develop amazing software that makes you want to buy their hardware (have you seen the new iPhoto for iPad app?). However, Apple is not a great accessory maker. And they don’t have to be, as there is a huge accessory after-market around iOS devices that gives you far more options than Apple could ever do. The iPad’s back is exposed: I am not worried about scratching the iPad’s screen when using it to read and write; however, I am concerned about scratches when stuffing the iPad in my bag to carry it around. The Smart Cover only covers the front, but not the back. Granted, a scratched back won’t impair usability at all, but it is a matter of design. The Smart Cover is not a very stable stand: I find it tips over too easily. There are probably a million and four alternatives for the Smart Cover out there, but I want to highlight 2.5 different approaches here: You can either just go with a basic sleeve or, if you like the basic idea of the Smart Cover, you can look around to find an alternative that makes up for its flaws but keeps its best features. UPDATE: If you want to think outside the box and turn your iPad into the ultimate writing machine, you can also check out my guide on how to find a dedicated keyboard case that perfectly fits your writing style. Sleeves have a couple of benefits over the Smart Cover: They protect your iPad from all sides, are very affordable, and you can find a pattern or material that is more unique and better reflects your personality. 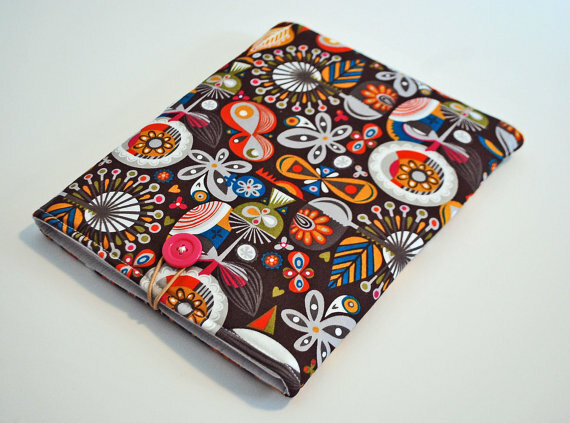 Etsy is a great place to find your dream iPad sleeve. You can get really nice ones for $12, and obviously you will always find more expensive ones. Etsy is a great place to hunt for an iPad sleeve that is affordable and than brings out your personality. Some functions of the Smart Cover are lost with sleeves though. A sleeve won’t auto-wake your iPad and also won’t double-function as a stand. However, you can always improvise and use a book or your wallet to tilt your iPad for easier typing. If you really would like to keep the basic idea of the Smart Cover / Case (i.e., the fold-to-stand mechanism, auto-wake function), but you would like to stand a little out of the crowd and save a few bucks in the process, these Smart Case alternatives are for you. You can often find a reduced price for the Griffin IntelliCase ($30-60, pictured on the right) and the Marware MicroShell Folio ($30-60). I haven’t tried any of these, but both have back protection, stand mechanism (I can’t speak to their stability though), and auto-wake. 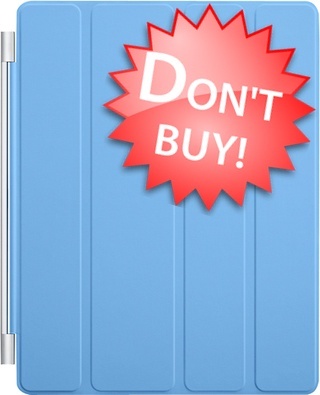 Since the introduction of the Apple Smart Case, the prices of these covers went down considerably, often cutting in half. As I am writing this, both the Griffin and the Marware are priced around $30 at Amazon, twenty dollar less than what Apple charges for its Smart Case. Note: Make sure that you get a cover specifically for your iPad’s generation, as the third-gen iPad is slightly thicker than the second-gen iPad. Sharing is caring: If you find this post helpful, please share it with your social networks by using the options at the side or the top / bottom. And if you have another minute to spare, you can support academiPad even more. I bashed out against screen protectors quite loudly, but I am fine with back protectors as a “half solution” to the flaws of Apple’s Smart Cover (that is, as long as the company selling you the back protector does not try to lure you into buying a stupid screen protector). If scratches to the back of your iPad are your main concern with Apple’s Smart Cover, you can just pick up one of these back protectors for little money (e.g., SGP’s Skin Guard for $20, Enki’s Genius Case for $25, or Incipio’s Smart Feather case for $18-25). 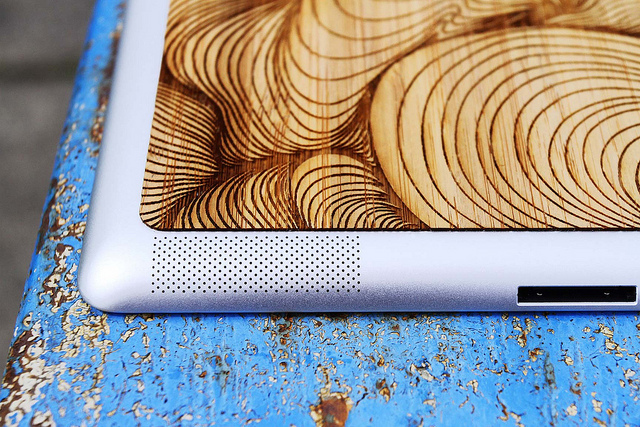 If you feel bold enough, you can add some natural touch to your iPad with the Grove Skin for $39 (pictured above) or fine-tune your design with a GelaSkins for $30 (pictured below). Again, I haven’t tried any of these (I like the last two though), and in my opinion they don’t do much more than a cheaper and more functional sleeve would do. Okay, such a back protector would have saved my iPad 1 back from scratches carved in by the winter salt on my desk (that was pure stupidity on my side! ), so maybe it is worth it. The good (or bad?) thing about such back protectors is that they give you full flexibility of using Apple’s Smart Cover or more luxurious lookalikes (see my personal design favorite, the Miniot Cover for $71). However, there is no bargain for you to be made here, as you would still need a Smart Cover or something else on the front in addition to such a back protector. If your main concern is money and you don’t think you would use the stand feature of a Smart Cover (lookalike), then I suggest you go with a sleeve. I am having a sleeve myself, and I either use the sleeve or a dedicated notebook-style case when on the move (depending on my mood and the occasion). The added benefit of a sleeve is that you can support local producers on Etsy, and you can get something truly unique and handmade. On the flip side, this article might not save you money at all if you decide to go with a better protected Smart Cover lookalike. Or maybe it still saves you money, since you didn’t have to buy a Smart Cover to figure out its flaws by yourself? There are plenty of other case options and stands to explore, and many not only offer better protection than the Smart Cover (I repeat: Apple is not a great accessory maker) but also much more functionality. For about the same money you would spend on one of these posh leather Smart Covers, you can turn the iPad into an ultimate writing machine by using a dedicated keyboard case instead. Check out this post to find out how to pick a keyboard case that perfectly fits your writing style. In any case (pun intended! 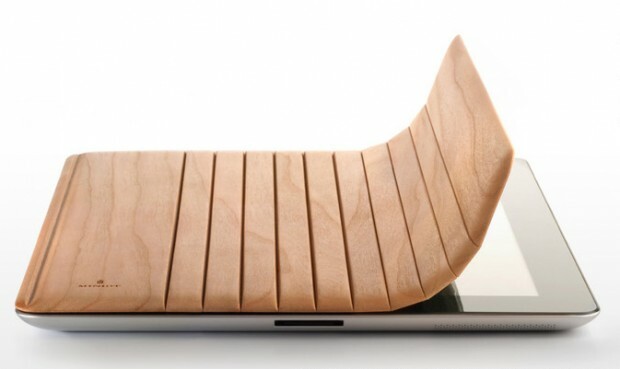 ), I still suggest to get yourself a sleeve for the days you want to enjoy your iPad el-natural. Do you know somebody who is in the process of buying an iPad? If yes – quick! – let this person know about this post before he or she buys something stupid. Next up: How to save up to $18 by saying “No!” to magical screen cleaning potions. Disclaimer: Don’t buy image by academiPad, Grove skin image by GroveMade via flickr. Gelaskins image from unknown. All other images by the respective manufacturers. Amazon links are affiliate links. Please consider sharing this article if you found it useful. I find it amusing that Apple puts so much effort into making iPads as thin and light as possible, yet other companies make hundreds of millions of dollars dramatically increasing the weight and iPads because people are obsessed with maintaining a pristine back that they can’t even see because it’s hidden in a clunky case that weighs almost as much as the iPad does. 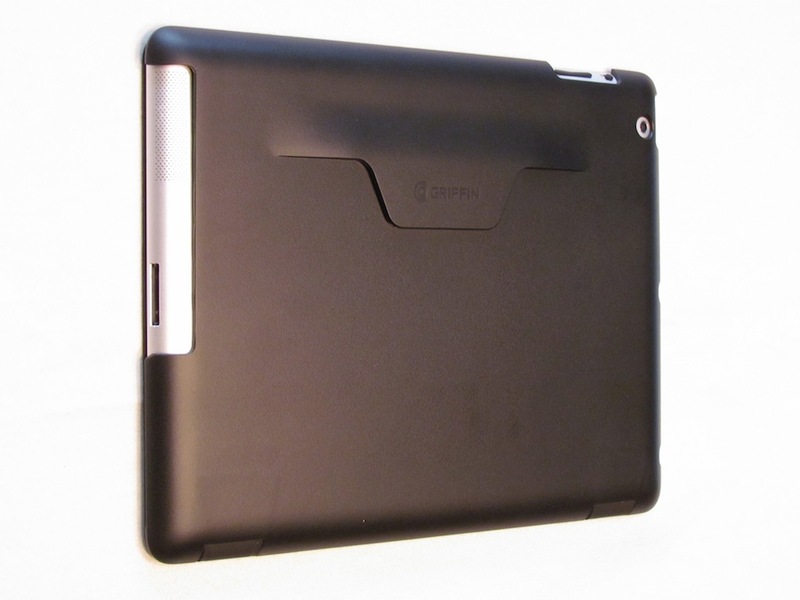 I just use a padded slipcase when traveling, but my iPad is naked when I’m using it. All the teachers in our 1:1 school rock a Padlette (http://www.padlette.com/), which is a fabulous alternative to a back cover, especially for teachers who are standing up, moving around. I got an ipad 4. Its impossible to hold. I use it for computer games like infinity blade but i need to sit it on a towel to use both hands. The curved back is RIDICULOUS, as is the volume control location. Apple really are the dumbest team of programmers on earth. Theyve damaged my life in many ways since i bought their stuff, and they have a culture of brain dead morons who support them and condemn people who suggest improvements or complain. If anyone is thinking of moving from ibm compatible to apple, dont be an idiot like i was. Macs are for dummies who dont make anything with their computers – these people were never geeks. Not a single one. Theyre all justin bieber fans at best. I actually prefer Smart Covers because they come on and off easily. And I just slap on a thin back cover on my iPad. I got the Caudabe Shell on Amazon which was relatively inexpensive and works well. Thanks for the review. The skins and sleeves are so pretty.